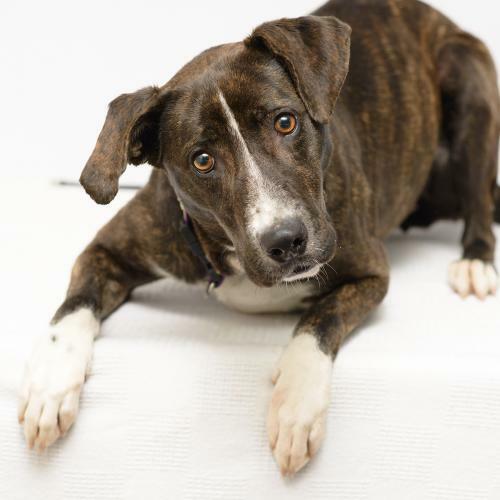 The Northern Chautauqua Canine Rescue Dog of the Week is Taylor, a beautifully marked brindle spayed female hound mix, possible a Tennessee Brindle Mountain cur mix. She’s a nice, friendly, young active girl about a year old who sometimes would just like to keep following her nose and exploring the area. She’s a very alert dog who notices everyone who enters the shelter and welcomes them vocally. She’d love a home where she can be exercised regularly and have a couch to curl up on at night time to enjoy with her people. Read about her and all the other dogs and puppies online at caninerescue.org. The shelter is located at 7540 N. Gale St. in Westfield and is open daily from 1-3 p.m. or by appointment by calling 326-7297.